You wouldn’t know it by looking out the window, but another cold storm is heading our way. Don’t dive for your blankets just yet though. Monday saw plenty of sunshine and temperatures in the 70s and 80s. “Sunshine Tuesday as well, though noticeably cooler, as some high level clouds pass overhead,” said forecaster Jodi Kodesh. On Wednesday and Thursday the marine layer will be ushered back in by a disturbance to our north. 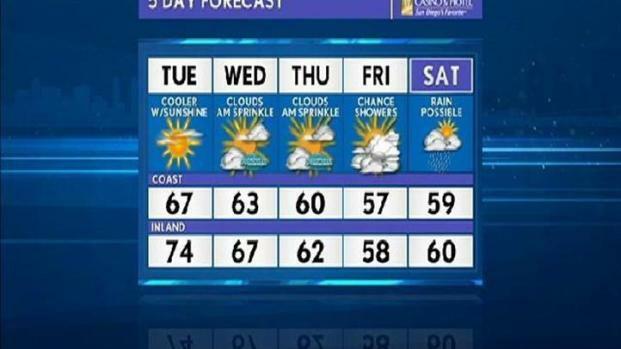 NBC San Diego Meteorologist, Jodi Kodesh has the weather forecast for Monday, April 4th. “Those days, early morning/late night fog could result in a sprinkle or two,” said Kodesh. “Any real chance for rain will come Friday and Saturday,” said Kodesh. It will be a cold storm, according to the National Weather Service (NWS). “A vigorous area of low pressure will dive south out of western Canada and reach Southern California on Friday. Ahead of it strong westerly winds will develop along with an increasing chance for showers, isolated thunderstorms and locally heavy snowfall,” the NWS reported. Westerly winds could prompt an advisory as early as Wednesday afternoon with gusts around 45 mph in the windiest spots. Winds will then strengthen Thursday afternoon. Gusts could exceed 60 mph in the mountains and locally in the deserts, according to forecasters. “Rough seas due to a large wind swell and possible gale force wind gusts could create hazardous conditions for any small craft in our coastal waters on Thursday. Mariners should plan accordingly,” the NWS reported. Snow levels could lower to around 4000 feet by Friday morning. “Isolated thunderstorms will be possible with locally heavy downpours Friday into Saturday,” the NWS reported. Snow and dense fog could make for hazardous conditions in the mountains.